When his mother discovers a message in a bottle washed up on a Florida beach, Tanner Thomas scoffs at her insistence he contact the person who penned the note. With a vague promise to think about it, Tanner promptly tucks the bottle away and goes on with his life. Two years later, he finds the bottle in the back of a closet and can’t get the woman off his mind. Tormented by thoughts of the author of the sweet, romantic letter, Tanner finally reaches out to the old-fashioned girl, unprepared to embark on the adventure of a lifetime. This little excerpt is from when Rose first meets Tanner. When the man she’d seen on the beach last night strode inside, the cake stand slipped from her hands and fell to the floor with a loud clatter. Little cakes scattered everywhere. For the length of several heartbeats, Rose remained too stunned by his appearance to blink let alone move. Mercy, but he looked even better in the broad light of day than he had in the moonlight. “I’m sorry. I didn’t mean to startle you,” he said, his deep, resonant voice stirring something in her heart. As he bent down to help pick up the scattered cakes, Rose breathed in his fragrance. It smelled like musk and spicy woods, and something entirely too appealing for her own good. Tumnus scampered down the hall and into the fray, madly licking at frosting and crumbs stuck to the floor. 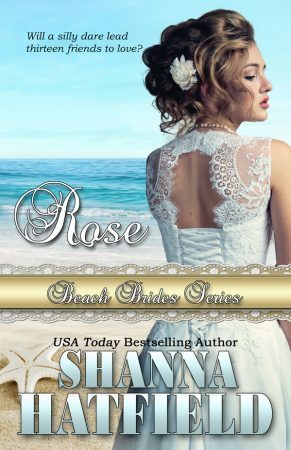 Rose stood and brushed crumbs from her hands, her gaze fixed on the man who slowly stood and offered her a heart-melting smile. The man’s lazy grin caused heat to churn in her stomach while an electrical current zinged up her arms and down her legs. If he kept smiling at her like that, she was sure Lucille and Zetta would have more than just cake crumbs to clean off the floor. They’d find her in a mushy puddle there as well.